North Carolina, a southeastern North American state, has long been an important agricultural site, being the nation’s leading producer of tobacco. It has also been a major source of manufactured goods, chemicals, textiles, and furniture since the 1920s. Raleigh is its capital, Charlotte is its largest city. North Carolina was named in honor of England’s King Charles I and King Charles II by colonist friends and supporters. 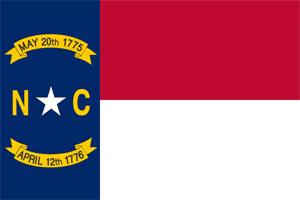 The Tar Heel State, its state nickname, became the 12th original Union state on November 21, 1789. It has set the pace for internal improvements and public education. Historically, it was from Kill Devil Hill near Kitty Hawk in North Carolina’s Outer Banks that the Wright brothers made the first ever successful airplane flight in 1903. •	Cherokee County Historical Museum – a former Native American trading post at Murphy which now houses 2,000 Native American lifestyle exhibits. Each year in July a wagon train trailing Daniel Boone’s path through the Blue Ridge range takes place while each December there is a commemoration of the first successful airplane flight in Wright Brothers National Memorial. Other annual events include drama and music festivals, boat races, and fishing tournaments in the Atlantic Ocean bordering the state in the east.